Saturday 8th Nov and the purple patch in Kent continues, with a late morning jaunt back to East Kent to hopefully see and photograph a female Desert Wheatear that had taken up residence on the golf course adjacent to the Ancient Highway, Sandwich Bay. 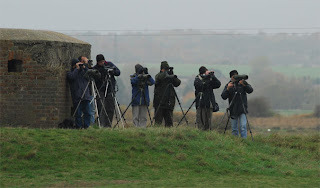 On arrival a small group of birders sheltering from the strong winds were huddled up next to a pill box minus the soldiers, and shortly after the Wheatear was seen feeding on the golf course completely undisturbed by the golfers nearby. As it appeared to be favouring the coastal footpath we wandered over to get better views and luckily it came along to inspect us. 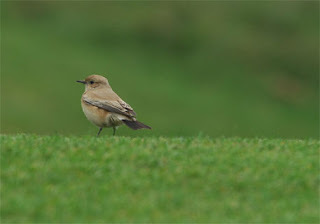 This was my 8th DW in the UK, and my 4th in Kent but represented the first ever record of a rare Wheatear for the Bay. A superb bird as all Wheatears are, and 'an expected' species in the UK in late Oct/early Nov this bird was one of at least four birds nationally this late autumn period. 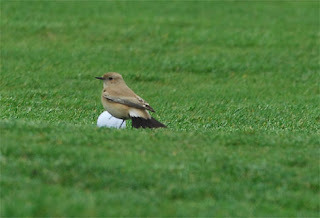 The bird clearly has an affinity with golf balls as above, and hasn't laid a large and somewhat 'painful' egg. The 'watchers' watching/looking for the bird. Is this the final good bird of the autumn in Kent? Will there still be more rarities to find? It's been a fantastic few weeks and has proved the point the East Kent really is mega for birding, who knows how many 'Desert' species have lurked, lurk along this coastal strip in the autumn. A great area to bird, full of potential, its just needs more coverage but all credit to those that regularly bird the area, they are fortunate to live near to a brilliant area, and deserve everything they find for the countless hours they spend in the field.